The coffee comes, interrupting our conversation for a second. The woman serving the coffee gently sets down the fresh coffee cups, picks up the old ones and looks respectfully at the older woman seated in the rocker in front of me, patiently waiting to continue her story. “Algo más?” She asks the old woman. The old woman smiles a frail smile and waves away the younger woman. 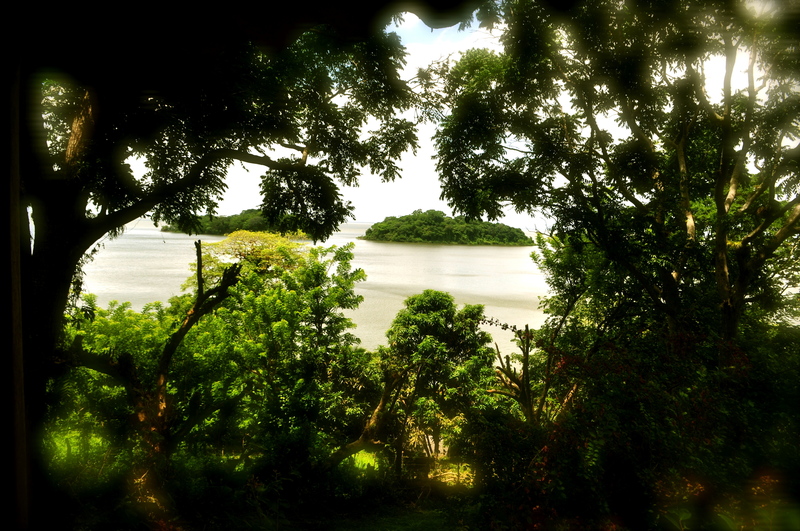 I watch her figure fade into the labyrinth of jungle and vines and wood and my eyes are drawn to the islets in the lake beyond her, majestic and overgrown islands of green surrounding by screeching parrots coming home for the night. Dusk has arrived in the Solentiname Islands and has found me on a sprawling veranda on the edge of one of the larger islands, listening to stories of lost lovers, of war and of dreams long past. I tuck my feet under me, rearrange the blanket around them and take a sip of coffee. She folds her hands together and looks down at them. Her hands are wrinkled, like those of my grandmother. I know if I touched them they would be soft and warm. I wonder how many people she has helped with those hands, how many babies she has held, how many lovers faces she has caressed, how many lives she has shaped. A melancholic smile comes over her face and she continues. “After that, the revolutionaries and internationalistas started coming. From Mexico, Costa Rica, Cuba as well as Spain and Germany they would come, eager to help us fight, unified in their dreams of justice and equality. And we Nicaraguans, we were ready. After almost half a century of brutal dictatorship we were more than ready, it was like a new beginning. Every day we would host people here, they would come to talk to Ernesto Cardenal, come to talk about politics, every other day we would have a party to say goodbye to the old volunteers and welcome the new. We didn’t have much, but somehow people always found enough. I was around your age, in my mid twenties, and responsible for hosting all these people, right here”. She gestured with her hand at roughly to where the women had disappeared. She smiles that same sad smile and a memory flickers in my own mind. My 9th grade Spanish class sang the song on a horribly off-tune note, not aware of what we were singing, just happy to have a language teacher that didn’t make us conjugate verbs the entire class. Frau Rink (for at this time I was in Germany), our Spanish teacher, sat looking at us with that same sad smile, a slightly glazed look in her eye. I would remember later looking at a picture of her, one pulled out of a dusty pile of memories from a box in a slum somewhere in Managua. It was taken somewhere near the Honduran border, close to where I now live, and in the picture she is holding a rifle in her hand, her hair wild, her face dirty, a man’s arm around her waist. In the picture she is laughing with a look of such happiness, of such ease despite the circumstances that it took my breath away when I first saw it. Frau Rink had been one of those internationalistas, one of the first groups of Germans to fly over during the height of the revolution to fight with the Sandinistas. The bell rang and the class filed out. I stayed, rehearsing the lines I had been practicing in my head since she first informed us of her trip last week and caught her arm as she left the classroom. She laughed good-heartedly and then perhaps saw how serious I was. Her smile changed to a look I hadn’t seen on her before. “Let me ask,” she said over her shoulder. That is how, 5 weeks later, in October of 2004, I landed for the first time in my life in Central America; in a country that up until a month before I had no idea existed. Since Frau Rink had started talking about it at the beginning of our school year it had fascinated me, or maybe it was her that fascinated me. How could a county evoke so much passion in a person? How could a cause make a young prospective female student drop her studies, fly halfway across the world and literally take up arms against a government that she didn’t know? What did this country have, that 25 years later could still bring tears to my teacher’s eyes? Frau Rink’s smile when she mentioned Nicaragua was one of such melancholy, such joy, such sadness, such mystery that I felt impelled to know for myself what it contained. So I stepped into a web of entanglement with this country that would see me return, almost 10 years to the exact date I had first arrived in Nicaragua. The old woman has fallen silent, staring off into the darkness that has slowly begun to engulf us. The sounds of the night are calming. Here and there a rustle of snakes or monkeys in the trees, every so often a fish jumping from the lake to catch one of the slower mosquitos, probably heavy and drunk off the fresh blood it has extracted from every piece of uncovered skin of my body. “And then?” I urge her on, “What happened then? I want to hear that people internalized this spirit of revolution; I want to hear that they shook off the dictator and climber to higher levels. Deep down I know the how the story goes, the same story that is written on the face of most of Latin America – after the revolution comes the reality of running a country; rationing, reforms, retribution. The government becomes stricter, itself replicating power in the only way it has ever been taught that power can be manifested. The brief years of alternative thought, Marxism, cooperativism and liberalist theology not enough to chip away at the ingrained paradigm of totalitarianism and populism that is entrenched in peoples minds here. The same people that helped bring the government to power become disillusioned with the process, themselves retreating into their communal and familial safety nets, distancing themselves from the very thing that they sought to achieve: political liberation. The candle dies down to a flicker and then splutters and dies. And then the story continues. Thesis-Antithesis –Synthesis. “And then? Then the civil war happened. War isn’t the same if you are not fighting for something you believe is just. Then the Americans came, the contras came, the country was split apart, whole families were split apart. We were still fighting, yes, but we were fighting to survive, we weren’t fighting for a cause anymore. Plus we were tired of fighting. Life here wasn’t the same during the 80’s. The internationalistas left, people stopped playing the guitars and reciting poetry. It became about preservation, not transformation.” Here she pauses, a bitter look on her face. Her eyelids are drooping. The younger woman returns to collect our coffee cups, cold dregs in the bottoms of the cups a reminder that I have been here too long. As I leave, I look at the old woman’s paintings on the wall. Most of them are done in the traditional primitivist style of the islands – intricate, miniscule, and mysterious. One painting stands out, so different from all the rest: a man and a woman dancing on the porch, surrounded by islands of greenery and parrots overhead. His army boots are unlaced, a traditional beret of the Sandinistas on his head. The woman is being twirled around; her head hanging back, her mouth open in laughter. Yo te quiero mucho mas.